Rob Ickes is no stranger to the resophonic guitar. Indeed he has won the IBMA’s “Dobro Player of the Year Award” no less than 15 times. 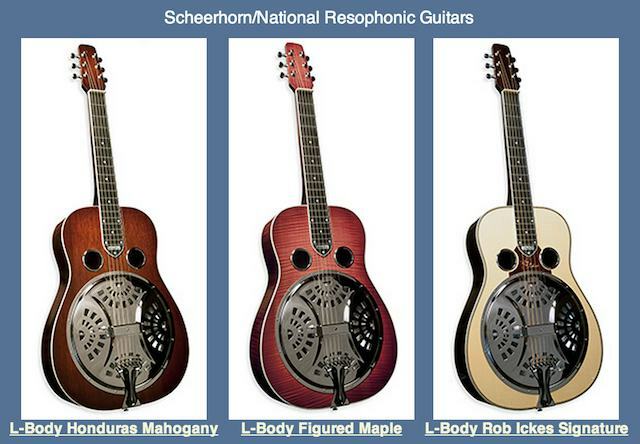 Rob has announced the release of the new “Rob Ickes Signature Model” Scheerhorn/National Resophonic Guitar. In addition to Rob’s model, there are two other new models to choose from. These are all L-body, solid wood guitars designed by Tim Scheerhorn and made in the USA. All three guitars are available now at Rob’s website. You may also email the company via the website’s contact page.